Several tax plans have been floated this legislative session in Alabama to address the state’s FY 2016 budget shortfall that could be up to $290 million. The first tax proposal was announced by Governor Robert Bentley in late February—it’s a mixed bag that increases seven different tax types. The second plan, floated in early May by Senate President Pro Tempore Del Marsh, proposes a constitutional amendment allowing casinos to open in the state, in addition to creating a state lottery. Finally, House Republicans released a tax plan (also in early May) that would have increased various taxes and fees and transfer funds from the state’s Education Trust Fund. Governor Bentley’s Plan: summary provided by the Governor’s Office and bill information for HB 142, HB 201, HB 277, HB 240, and HB 267 (includes bill texts, any ammendemnts offered, legislative histories, and fiscal notes). 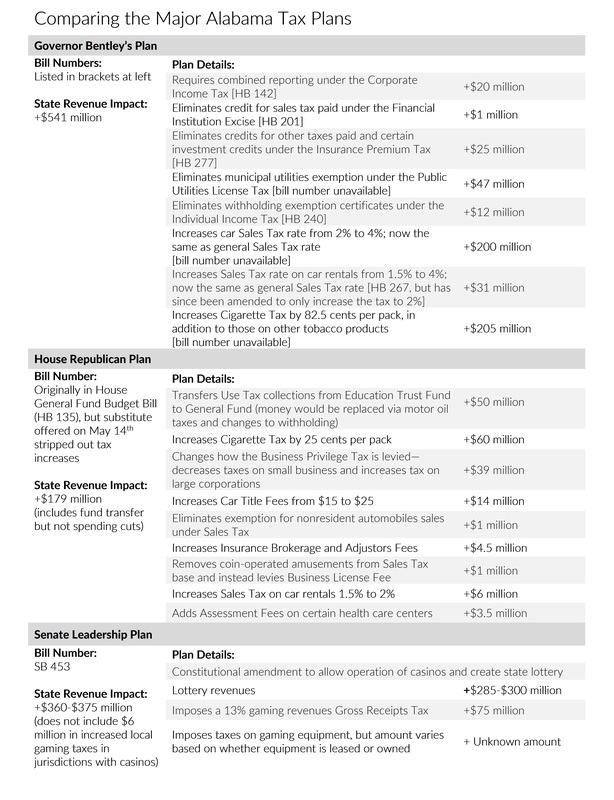 House Republican Plan: summary of original plan provided by House Speaker’s Office (as reported by Yellowhammer News) and May 14th House Budget Bill substitute. Senate Leadership Plan: bill text, legislative history, and fiscal note. There’s not a lot of overlap between the proposals. Both the Governor’s plan and the House plan would increase sales taxes (by adding a few purchase types to the base or increasing rates on certain types of transactions) and cigarettes taxes (by increasing rates)—but the similarities end there. 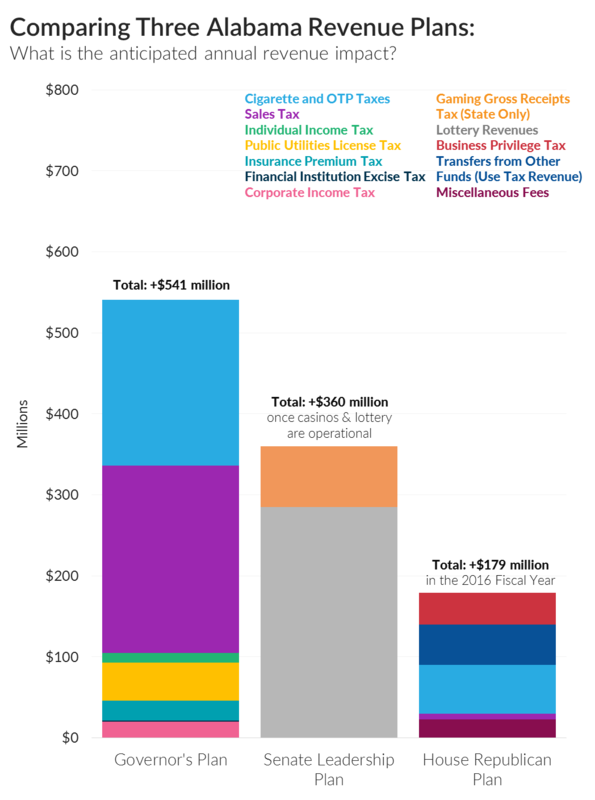 The graphic below shows the relative size of each tax plan, in addition to each plan’s tax type breakdown (click to enlarge). As you can see, the three are quite different in content. The House Ways and Means General Fund Committee approved the stripped-down budget Thursday morning, with deep cuts to state agencies after lawmakers were unable to reach an agreement on tax bills to fill a fiscal shortfall. Chairman Steve Clouse said the cuts would cause dramatic reductions in services. However, he said it is the reality without new revenue. Clouse said the House GOP proposal fell apart after Republican senators sent a message that they wouldn't support the tax bills. "I spoke with the speaker yesterday and let the speaker know that in the Senate there was not wide support — very little support— for tax increases on the people," Senate President Pro Tem Del Marsh, R-Anniston, said. Marsh is pushing lottery and casino legislation as an alternative, but those funds would not be available for the next fiscal year. … Senate leadership is refusing to consider tax hike proposals from the Governor and the House, leaning instead toward government streamlining measures and/or passing a lottery and gambling expansion package. By stripping tax increases out of the budget, Rep. Clouse said it is up to the Senate to come up with a revenue solution for the budget shortfall. Gov. Bentley has said he will veto any budget that does not include significant increases in government revenue. We’ll follow the issue as the legislative session continues. More on Alabama here. Follow Liz on Twitter @elizabeth_malm.